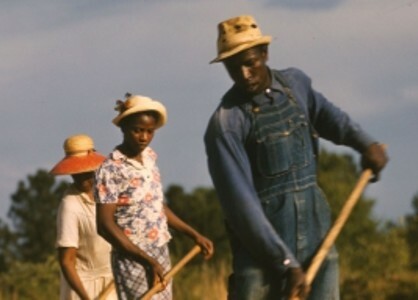 Sharecropping is the working of a piece of land by a tenant in exchange for a share of the revenue that the tenant’s crops earn when the landowner sells them. Sharecropping or tenant farming kept European peasants in hock to feudal landlords for centuries, and took hold in the United States after the Civil War ended in 1865. The Civil War ended slavery in the United States and put southern landowners in a pickle. Without slaves, how would the plantation owners farm their vast tracts of land? By the end of the war, the South’s economy was so decimated that most landowners couldn’t afford to buy seeds and fertilizer, let alone hire workers. Meanwhile, freed slaves had no work and nowhere to go. Many were living in their old slave quarters, or in shacks they’d thrown up, and were trying to grow enough food in their gardens to keep from starving to death. A bargain was struck. White landowners mortgaged their properties or convinced local banks to extend them credit to buy seeds and plantings, tools, and basic provisions for the freed slaves. Ex-slaves, in turn, agreed to stay on the plantations and plant and harvest the crops in exchange for half their value. Unfortunately, because the landowners sold their tenants seeds, fertilizer, tools, food, and other supplies on credit, the owners set both prices and interest rates as they wished. Although some landowners were fair, many took advantage by overcharging tenants so that, come harvest time, a tenant’s share of the revenue after expenses would come out to zero, or even leave the cropper in debt to the landlord. Once the system got going, the larger plantations printed their own money and minted their own coins for sharecroppers to use at the plantation store. These stores were in a position to charge exorbitant prices for necessities. “Little” Milton Campbell, Jr. was born in Inverness, Mississippi, in 1934 to sharecropper parents, and grew up working the fields. “Back when I was a kid, that was what most people had to do,” he recalled. “Some black people by then had their own land, but unfortunately we were not one of those families. It was hard, working in the fields in the hot sun, sometimes in the rain. You’d go out so early, before the sun came up, and stay there just about ’til the sun was going down. It was very hard and you got very little pay for the hard work that you did. Some plantation owners were fair, and their tenants were able to work their way off the land and into better lives. The majority, unfortunately, kept their tenants tied to them through debt. The crop never seemed to pay off the cost of the land rental, the mules, and the supplies. The plantation owner would offer to lend the sharecropper money at high interest rates to get through the next year, perpetuating a vicious cycle. What finally crashed the sharecropping system was the plantation owners’ over-reliance on King Cotton. As the supply of cotton increased, its price fell, resulting in a spiral of debt for both owners and sharecroppers in the 1880s and 1890s. The poverty among sharecropping families became very severe. The typical sharecropping woman kept house with only a straw broom, a laundry tub, a cooking kettle, and a water pail. Desperate to make ends meet, African American men took to the rails as hoe-boys or hobos, hitting harvest time in different regions of the country to earn money. The women sold chickens, eggs, milk, and cheese. Through hard work and sacrifice, many families freed themselves from sharecropping.